So I'm now making a snood. It's basically a hair net but it is a very old type dating back to the mid evil period. With all the candy making I do which is coming up this time of year and also Anja's band has a apple pie fundraiser where we (parents and students) get together and make hundreds of pies (400 last year) I wanted a crafty way to keep my hair back so a snood it is! The pattern can be found here Perky Snood . The pattern calls for a long trebble crochet and what you do for that is yo 3 times before inserting your hook into your work and draw through 2 loops each time (total of 4 times per stitch). could also work as a lacrosse stick net! yes it could. 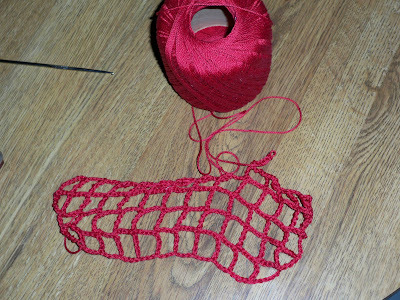 this is a very sturdy netting stitch which can be used for many things. All the ideas were running through my head as I was working this up.